For the second year in a row Adam Robinson Design has featured a garden in the Hidden Design Festival. This year we featured one of our favourite multi-use spaces from our Fairlight project. The garden was designed for a young family and makes clever use of design features to maximise on the smaller size of the space for outdoor living. Seamlessly opening out from the existing indoor living space, the garden creates a sanctuary for the family to grow in to. A contemporary mix of traditional materials has been put together with the intention of giving off both a timeless look and coastal feel. Stone walling, stone paving and hardwood timbers set the tone and define each individual living space. Casual seating leads down in to a lounge area which then steps down to a dining space, great for all types of outdoor entertaining. As a design statement, white painted breeze blocks have been placed in the garden. They feature as a wall to the rear of the water feature on the far side of the garden. This ties in with the front of the house where breeze blocks have been used for the boundary fence. As the design features are strong, a relaxed planting plan has been put in place, making the garden feel quite wild and lush. 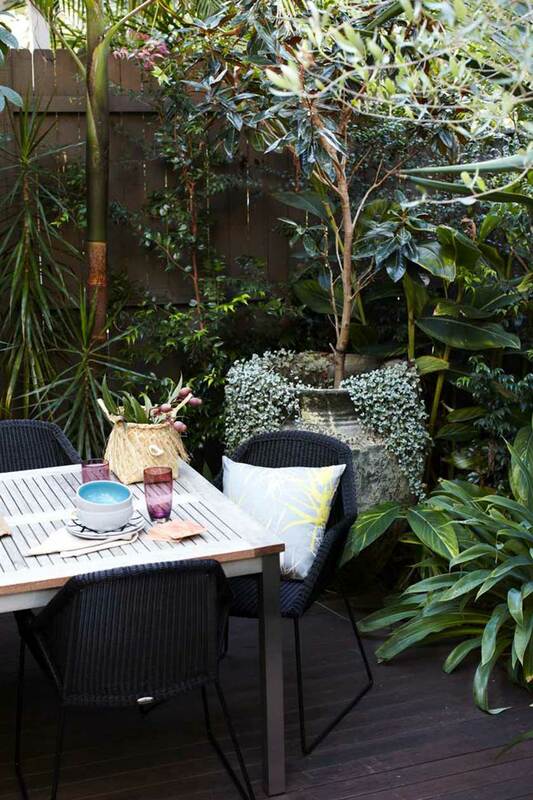 A selection of different colours, textures and plant heights have been planted together to create depth within the space. This selection also adds to that relaxed, oasis feel, allowing the garden to grow out naturally.